In an endeavor to get away for a bit and focus on myself, I find myself halfway across the world in a country I’ve never been to. The sights, the sounds, the smells… they’re all so different from what I experience daily in the States. I originally wasn’t planning on blogging here, but I wanted to share some of the beauty of this country. 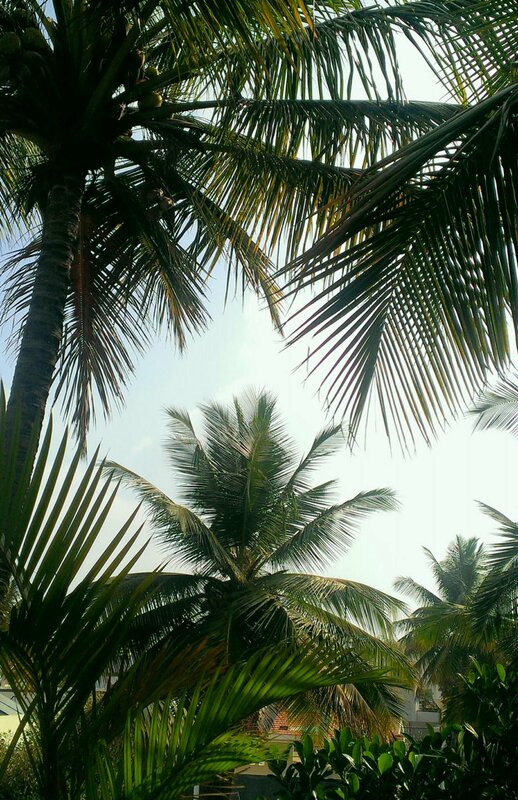 Coconut trees so close I can touch them from the rooftop! This is the lovely view from the rooftop where I eat breakfast some mornings. And yes, those are coconut trees! Not palm trees. Did you know there is a difference?! What has happened is that both mornings after yoga so far, I’ve bought a coconut from the coconut cart guy (yes, that’s a technical term) and had fresh coconut water straight from the source! It’s delicious, in case you’re wondering. So that is all I have to share for now. More will come as I take pictures and feel like posting but until then, goodbye from the land of coconuts and warmth! This entry was posted in Uncategorized and tagged coconuts, experiences, travel. Bookmark the permalink.